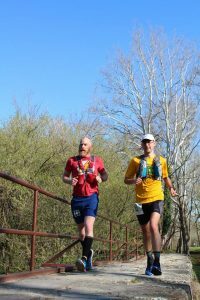 My last major race was the Rick O’Donnell Ultra Challenge where I completed 9 laps (47 miles) in just under 8 hours to finish 2nd. I recovered quickly after the race building back up to 50 mile weeks within a month and unexpectedly started to string together 200+ mile months (having only one previously). In late October, I stated to meet regularly on Tuesday nights with the Frederick Steeplechasers for their Baker Park runs to stay motivated. I capped off my 2017 racing year on Thanksgiving with a 30:06 five mile which qualified me for the Steeplechasers development racing team. I knew I wanted to do a bigger race, but I didn’t know what. 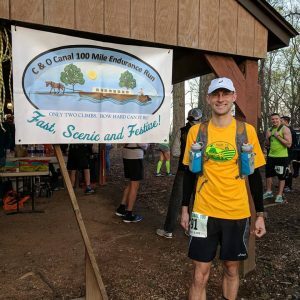 After a cruise in late December, I decided that I had good base mileage and that it would be a good time to attempt a 100 miler. 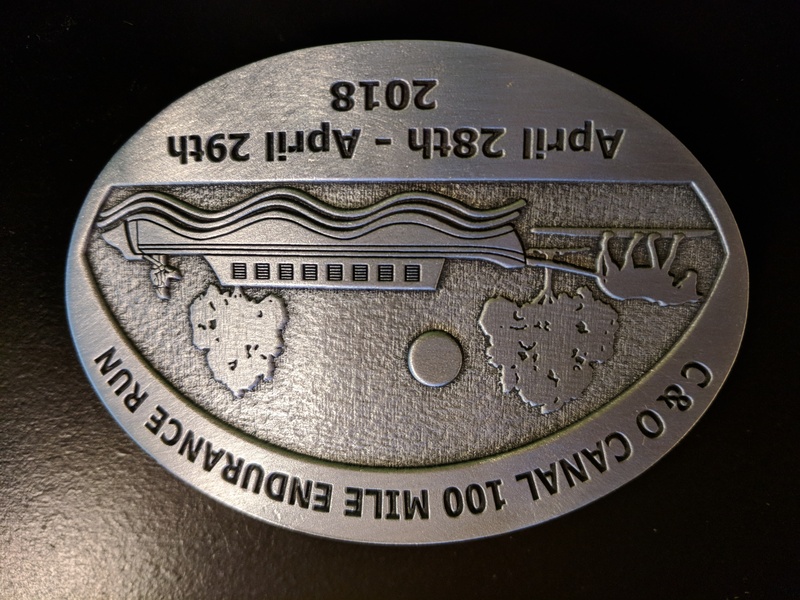 I wanted something close to Frederick and found the C&O Canal 100 which started about 25 minutes from our home. 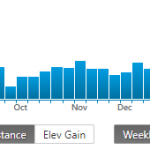 I knew I needed to seriously increase my mileage and I started to build to 60+ mile weeks by the end of January. I started to put a lot of miles in with Dustin, Evan, Jenny, and Louis on Tuesdays and Saturdays before having a slight injury set back the first week of February after rolling my ankle. 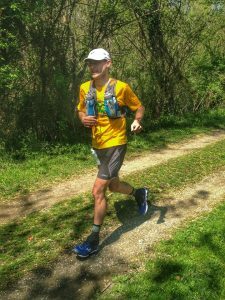 I was able to rest up for a few weeks and start building my mileage back up and peaking at just over 90 miles four weeks from the race. 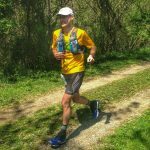 I tapered for three weeks with a final tune-up race at the Makin’ Hay 10k where I set a 10k PR. The race is held on the mostly flat C&O Canal towpath that runs along the Potomac river from Cumberland, MD to Washington, DC. 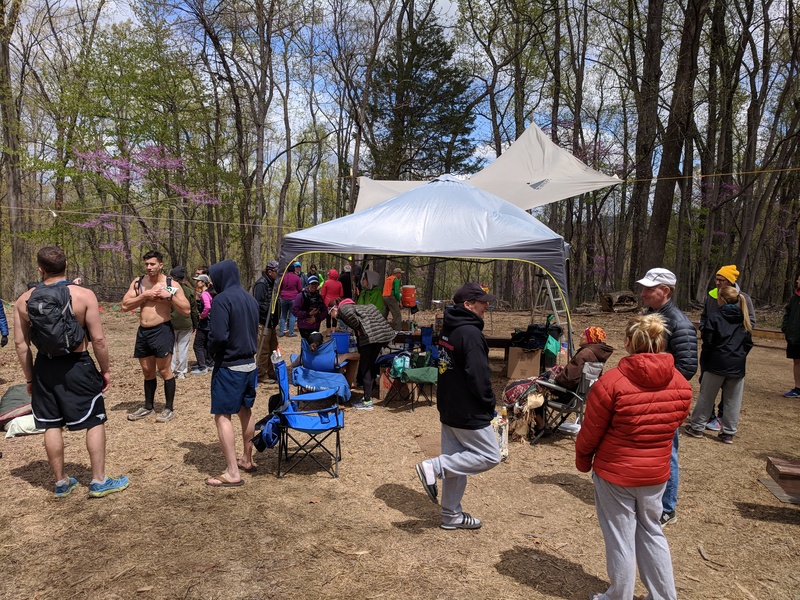 The race utilizes about 30 miles of the towpath near Harpers Ferry, WV starting at Camp Manidokan. 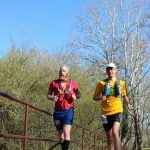 It starts by looping runners around a grassy field to spread runners out before entering a half-mile section of mostly unmaintained single-track trail down to the towpath. 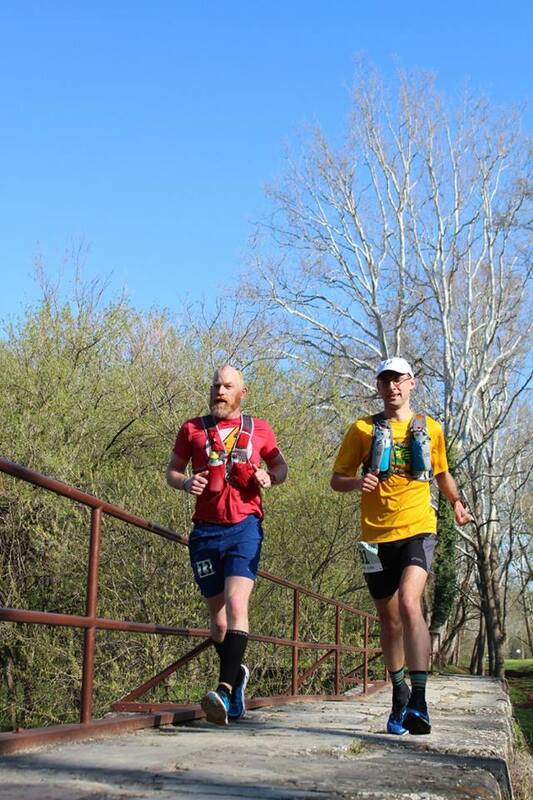 After entering the towpath, runners continue north 10 miles past Antietam and then 30 miles south to Nolands Ferry. 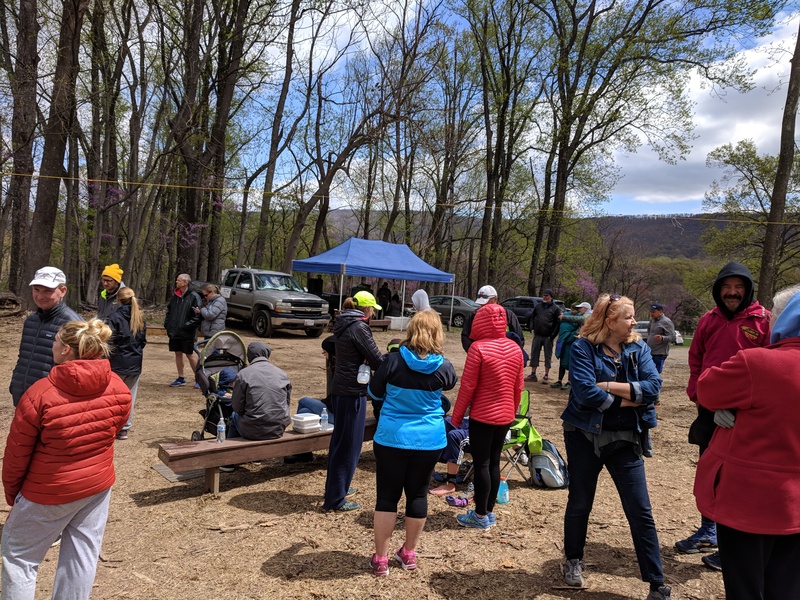 After Nolands Ferry, runners return northbound on the towpath to Camp and climb the only significant hill in the race completing the first 60 miles. After camp, runners run the southbound leg again to reach the full distance. 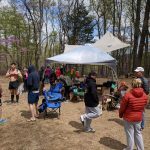 Given the semi-looped nature of the course, it provided ample aid stations, 18 to be exact, spaced no more than 7 miles apart. There were two drop bag locations, Brunswick (29/50/70/90mi) and Nolands Ferry (40/80mi). I had my best training block leading up to the race, so I was fairly confident that I could complete the race. I really didn’t want to spend too much time on the course, because that could get boring, so why not push myself and see how fast I could go? In addition, I have trouble running slow and then put me in a race or with friends and I just seem to run needlessly fast. Instead of fighting my speed and not being comfortable running, I decided to go out with whatever pace kept me from sweating for the first 20-30 miles and play it be ear from there. If everything was going well at that point, I would try to maintain that pace, but no faster. If I was starting to feel some fatigue, then I would start to mix in some walking to keep my heartrate low. 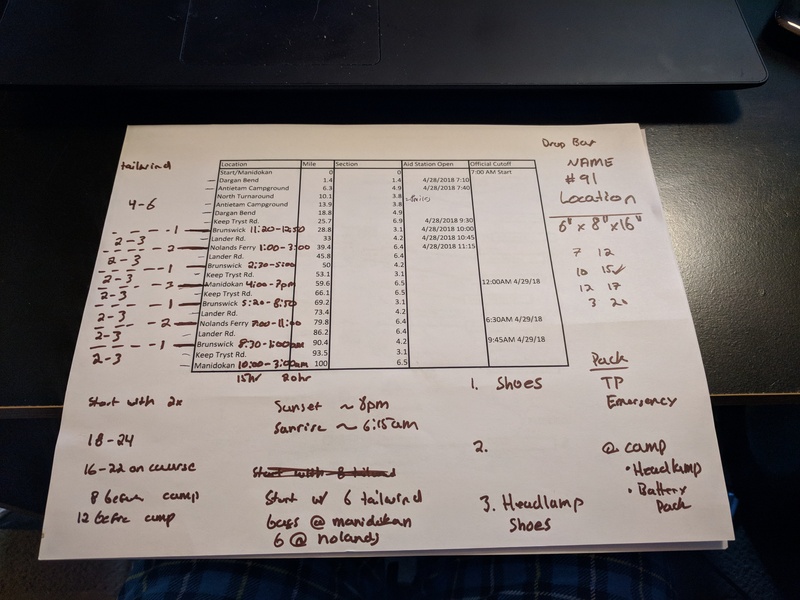 I had been planning for the race in my head for months, but only did the serious planning the evening before the race because I wasn’t sure about the weather. 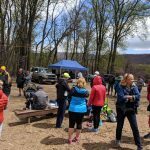 Leading up to the race, the long range looked perfect with a high in the upper 60s and mostly sunny. As race day grew closer, the forecast temperature increased to the lower 70s and so did the chance for rain. I queried my co-workers for a weather forecast the day before and they agreed that there was a good chance of a quick line moving through midday. 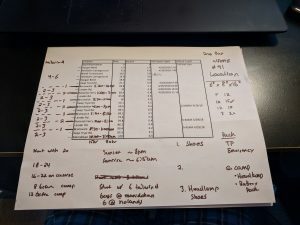 This altered significantly what I was placing in my drop bags because I really didn’t want to run the final 50 miles in wet clothes (my estimated pace and rain timing). I had my traditional pre-race meal of pasta with butter and parmesan cheese and got to bed by 9pm. I slept well until about 30 minutes before my alarm at 5am. I put on my race gear and spare shoes and socks, apparently the grass tends to be long and dewy before the race, I didn’t want to start off with wet shoes. We arrived at camp around 5:45am and my running buddy Dustin directed us to a parking spot and hoped that the trusty corolla could reverse out of it with the wet grass when Mallie went to leave. 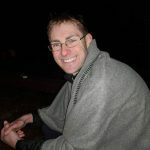 After picking up my bib and race jacket I chilled in the car until putting on my racing shoes, socks, and gaiters around 6:30am and headed up to the pre-race briefing. I ran into fellow Steeplechasers Billy and Pam who were also running the race. It was Billy’s first 100 too and Pam’s second this year. 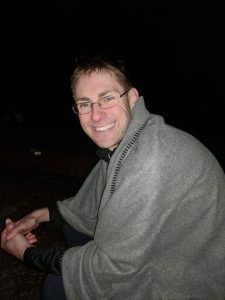 I chatted a bit with Paul who runs the Keep Tryst aid station and who is an excellent ultrarunner himself. He kindly informed me that ultra signup had me seeded high for the race. I also received some great advice from Bill, who is the race director for the Makin’ Hay 10 which I had won two weeks earlier, to just “run my own race”. A few quick words by the race director Lance and we were on our way right at 7am. I started near the front, so I was able to quickly fall in line in second place just behind the guy that would go on to lead the first 52 miles. After the field loop, we headed down a hill between some buildings to the single track. We made our first turn into the woods, in the middle of a parking lot near a group of people that had parted around what looked like a path. The top four of us had made it about 50 feet down the trail before we heard yelling that we were going the wrong way. I quickly scrambled back up the little hill and continued down the main trail. I should have known better than to cross a ribbon on the ground, but the early race excitement got to me and I just blindly followed the person in front of me. I descended into the single track in sixth place and was surprised by just how step it was. It was runnable, but with the fall leaves still on the trail you had to be careful not to miss a step cut. The stream wasn’t too high, and I was able to jump across a few rocks and walk a log to avoid getting my feet wet. A quick road crossing and I was heading northbound on the Canal. The cool morning allowed me to settle into a comfortable 8:30 pace and start my routine of sipping on Tailwind. As I arrived at Antietam AS the volunteers topped off my trail wind and I was on my way in less than 30 seconds. The Tailwind was a test to see how strong they were making it, this would determine if I could use their mix or if I would have to get water and mix my own. Luckily, it was strong enough and I didn’t have to spend time doing my own. Shortly after the aid station, I passed a few runners and caught up to the second-place runner, a guy named Jason. We settled into the same pace and started chatting. He had done a few 100s before and was from Ohio. 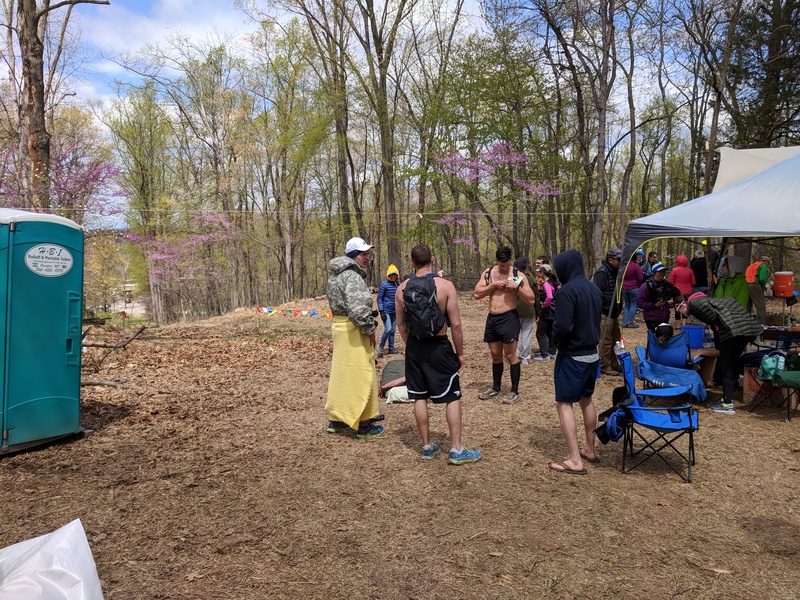 We had some nice conversation out to the turnaround and back about 100s, Frederick, local running scenes, training, and life. This is my least favorite section of the course because there isn’t much, just the trail with a few seldom used access points so the conversation helped pass the time. Shortly before the aid station we began to encounter most of the runners, so it was nice seeing everyone cheering each other along. Returning to Antietam the volunteers topped off my Tailwind and Jason and I were quickly on our way. Another quick stop. 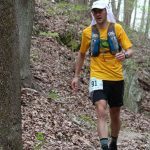 After my first 50 where I spent way too much time in aid stations I vowed to spend the shortest amount of time I needed at them. I like to grab what I need and then at least start walking away from the station, even if I’m still easting. Walking is faster than standing around. Jason and I continued together until I had to make an emergency bathroom break. Luckily it was a quick stop and I was on my way again. 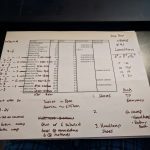 A little bit of solo running allowed me to do a self-assessment and I realized I was feeling pretty good, but I shouldn’t push it any harder. I reached Dargan Bend at about 8:32 race pace. Tailwind was topped off and I grabbed some Mt. Dew and Swedish fish. I left the aid station about the same time as Jason, so we continued chatting. A few minutes after the aid station, we both realized that we missed spotting the turn off to Camp. We both wanted some visual reference for when we had to spot it many hours later and much more tired. Our conversation drifted from life to the race… because the sun was starting to soak the trail. I knew this section of trail wasn’t well shaded and Jason was concerned because he didn’t have sunscreen and he had no hair. However, usually, most of the remainder of the trail is well shaded. But this year there was one problem, a late spring. The leaves were barely out and almost the entire trail was baked in the sun. Around Harpers Ferry (about halfway to Keep Tryst), Jason started to mix in some walking, so I wished him the best and pushed on. Not longer after leaving Jason I saw three familiar faces ahead, Jenny, Evan, and Dustin who were would for their Saturday long run. A quick high-five in passing was a great boost to the spirts. I was able to reach Keep Tryst at 8:34 race pace and had them refill my Tailwind. I was also looking for some salty foods because it was heating up and I tend to sweat a lot. At Rick’s Run I found that keeping my salt intake high fended off cramping. I grabbed some ginger ale, and, in my haste, I grabbed some pickles and tossed them into my cup too. Being a well-prepared aid station, they also knew that runners would need sunscreen so a quick spray down and I was on my way. Taking a few steps away from the aid station I realized I put my pickles in ginger ale, not wanting to waste anything I drank it anyway. Boy, it was surprisingly good. The saltiness of the pickles and the cool refreshing taste of the ginger hit the spot. I crossed the first marathon mark in 3:44, my third fastest marathon and only a few minutes off my first. I start to think about how I can make pickles in ginger ale into a viable product, but before drawing up a business plan I arrived at Brunswick. Since the Tailwind at the aid stations was good I didn’t need my drop bag so a quick top-off of Tailwind, some pretzels and more Mt. Dew and I continued. All I remember thinking here is that, man, it is getting hot out. All I can think about is salty foods and at that point I know I have significantly fallen behind on my food intake. My Tailwind consumption was good, but with the heat and pace I needed more. At Lander, I was surprised to see Jenny at the aid station and I refilled my Tailwind. I remember the first thing I said at the aid station was, “where is the saltiest thing you have.” The aid station had some S Caps, something I hadn’t had before, but I was desperate for some salt. I took two caps and had another quick turnaround from an aid station. Shortly after the aid station everything crashed. Apparently, I was running too fast for the conditions. I had a dual hamstring cramp and was forced to stop. Usually I’m able to stretch them out quickly, but these persisted for a good minute. I must have looked bad because a couple of cyclists stopped and asked if I was okay. After the cramps died off I was able to start walking and then lightly running again. 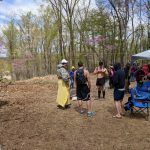 I continued to mix some walking and running until the aid station. This was the first section of the course in which I could tell any type of spacing between myself, the leader, and third place behind me. I passed the leader when I was a mile from the aid station. I knew he was two miles ahead and at our current pace that was about 16ish minutes. Another Tailwind top-off at the aid station, wet towel under my hat and I proceeded back northbound determined to whittle away at my 16 minute deficit. The cool towel and some cloud cover moving in allowed me to recover a bit and pick up my pace. I passed the third-place running about a mile out of Nolands so I knew I had a similar lead over third-place as I was behind first. Over this section I continued to mix in some walking breaks and chugged all my Tailwind as I greeted all the runners heading southbound. Back at Lander I was informed that the first-place runner had recently left. I made another quick turnaround grabbing more Tailwind and downing some S Caps with water. I think I had some Mt. Dew and peanut M&Ms. As I continued to battle the heat with walking breaks I arrived at Brunswick just as first-place was leaving, this was the first time I had seen him since our wrong turn at the start of the race. This was unsurprisingly highly motivating. I took some extra time Brunswick to cool down a bit and then continued my way with the leader sometimes visible on long straight sections of trail. Around mile 52 I would eventually close the gap and make a pass for the lead. As I was passing he shouted “Hey, how old are you?” to which I responded “30, how about you”, “41, ah you’re young”, with a laugh. At Keep Tryst I once again filled my Tailwind and quickly headed off because I knew camp was the next stop and that it would be a bit longer. Just before Harpers Ferry I had my first real conundrum. This was the most popular section of trail and I encountered a lot more hikers and cyclists… and some horses. In trail etiquette everyone yields to horses, which is good when you are approaching them from the front because you can step off to the side and let them walk past. However, in this case, I was approaching them from behind. They were talking pretty slowly and as I gained ground I didn’t know what to do because the last thing I want to do is spook a horse. Luckily, I spotted two cyclists approaching me from behind, so I was able to pick up my pace a tad to match about the time they would be passing the horses. They were able to call out from a distance and the horses moved to the side and I quietly followed behind. The slight pace increase took a bit out of me, so I wanted to walk, but I couldn’t because the horses would catch me. So, I guess that is a bit motivating. As I approached the camp turn off I was fearful of missing it because I didn’t spot it earlier in the day. To my relief the cone that had been the north turnaround point was not clearly visible on the side of the trail. I made the short jog across the grass and road and slowly worked my way up the single-track trail to camp. I ran into Bill at the bottom who was taking pictures. He offered some good advice and I started to think about what I wanted to do at camp in a few short minutes. 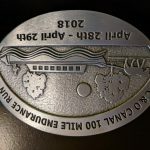 At camp I checked in completing the first 59.6 miles in 9:33. The aid station volunteers quickly grabbed my drop bag. I had planned on changing shoes, figuring my feet would need a change, but I made an executive decision not to because my feet were feeling good. I didn’t want to risk messing them up with a needless change. I switched shirts, applied body glide and bug repellant, and grabbed my headlamp, arm warmers, and battery charger. I think I was at camp about 5 minutes. After ensuring I had everything, I quickly headed back down the hill, across the stream, and back southbound on the towpath. I passed a few runners shortly after entering the towpath and was able to calculate my lead to be about 20 minutes. I figured it was a good time to charge my watch and phone because I had some renewed energy and it was a quiet section of trail. As my devices charged I was able to zone out and run/walk my way to Harpers Ferry. Around Harpers Ferry the trail became fairly crowded with tourists waiting for trains. No real delays with the masses, but I received some strange looks. As I came to Keep Tryst I was starting to feel the miles on my legs and body. This 6.5ish mile segment too 75 minutes putting my pace at about 11:00. I knew I was slowly down so I quickly grabbed some Tailwind and Swedish Fish at Keep Tryst and plowed on. Nothing hugely notable in this section, just grinding away. At this point a lot of the race starts to become a blur or just a flash of random memories. I remember coming into Brunswick and was surprised by Mallie. I tossed my bottles to be refilled with Tailwind and chatted with Mallie quickly. This was the point where I really broke down, I started crying and even to this moment I don’t know exactly why. It is just what my body wanted to do. I just complained to Mallie that this was a horrible idea and it sucked. She gave me some words of encouragement and I knew I couldn’t drop out of the race at mile 70, in first place, so I sucked it up and continued after a few minutes. My walking rate started to pick up as my lower right leg was starting to hurt more and more with running. I started to practice power walking as fast as I could to get a sense of pace for latter. I knew at some point I would have to stop running. My power walking pace at this point was 13:00 so I was feeling okay because I had a bit of a lead and was only going to drop a few minutes per mile off my pace. Arriving at Lander I grabbed more Tailwind and some S Caps and continued on my way. At this point I started to cut back my food intake because it was cooling down and I figured I only had about 25 miles to go. Shortly after Lander it was dark enough to flip my headlamp on. I always forgot how the headlamp narrows your world. It makes your mind focus where the light is and on nothing else. I just continued to grind away, one foot in front of another. Every step was starting to become a struggle at this point. But I looked forward to making the turn back to Camp for the last time. Heading to Nolands Ferry I was greeted by luminaries and tiki torches lining the path for the last tenth of a mile. It was a much-needed morale boost. I spent a bit longer at Nolands this time because it had started raining and I was just tired. After recovering enough, I started my trek northbound which gave me another opportunity to gauge my lead. I passed the leader, someone new, Victor, about 1.25 miles outside of camp giving me a 2.5 mile lead. At our current pace I estimated this to be about a 30 minute lead. I was excited at this point because I knew I had slowed so that must have meant that second place had slowed too to allow the gap to increase. At some point during this section I came to the realization that Bluebells are creepy at night. For those that don’t know, Bluebells are a beautiful flower that is abundant on the side of the towpath during Spring. Well, at night the green vegetation below disappears into the darkness and the flower seems to glow with the light of your headlamp. The ground looked like it was covered in floating orbs of white light. This is trippy at mile 85 alone on the towpath. This section was lonely, I think I only saw four other runners over almost 13 miles. However, I was on the home stretch and that was all the motivation I needed. At some point I passed a campground off the trail and the campers decided to yell at me that I was going the wrong way. They had seen all the runners going southbound but being the first running going northbound they were confused. After so many hours running I had to do a double take to make sure I really was going the correct way. I made another quick stop at Lander for Tailwind and off into the darkness I went again. Running is become extremely painful at this point, so I have to resort to mostly walking. I’m still able to maintain about 11:00 pace with this method, but I was clearly slowing. Heading into Brunswick I received an update that second place had checked into Lander just 20 minutes behind me. I started doing the math and realized I lost 10minutes over 6.6 miles. Doing some quick math I realized that it would be a close finish, I had to keep pushing. With this knowledge I grabbed a splash of Tailwind and went on, I don’t think I was there for more than 20 seconds. My brain or body wasn’t functioning very well at this point. My mind started to wander to distract myself from the pain of running. Knowing the gap was closing I tried to run as much as I could, but I just couldn’t do it anymore. I just had to power walk and hope my math was right. As the lights of Keep Tryst drew near I topped off my Tailwind and found our second place was 17 minutes behind me at Brunswick. Still closing the gap, but I thought I still had enough of a lead to barely squeeze out the victory. It was now after 11pm and I only passed a few other runners as it was getting close to some cutoff times. Around Harpers Ferry I pulled out my phone to check the split times at Keep Tryst. I discovered that second place had checked in only 11 minutes behind me. He had gained almost 7 minutes over 3.1 miles. I knew what pace I was running and how that tailed off and there was only one explanation for how he was catching, he was running really fast. Not only fast, but getting faster. I tried to give one more burst of running, but my body just couldn’t do it. I expended everything I had. At this point I realized that just finishing was at risk so I gave up trying to stay in front and went into survival mode. My pace dropped considerably and I was just focused on the ground in front of me. About 2.5 miles from the finish there is a slight bend in the towpath and I turned around and saw a headlamp not too far behind me. With two miles to go, second place approached from behind and passed me. I congratulated him as he passed and said that he deserved with the run he put in during the final 10. It was an unbelievably good run, extremely impressive. Confused, he turned around and asked if I was in first. I told him I was and now he was. He stopped, turned around and came back to shake my hand. This is what ultra-running is all about, the comradery between competitors. Victor then continued after ahead of me looking as strong as his first and I slowly puttered my way along. I just wanted to finish. After slowly meandering my way along the towpath I turned off the path and onto the single track. Only two stream crossings and a hill to go. All day I had hopped between rocks to keep my feet dry, but with my feet feeling like lead weights and the finish line in sight I just walked through the foot-deep water. The cold felt good on my legs and I wasn’t feeling much at that point anyway. I slowly started to climb the trail with my hands my knees only to realize I was on the wrong trail, I had to back-track a few hundred feet to pick up the trail again. 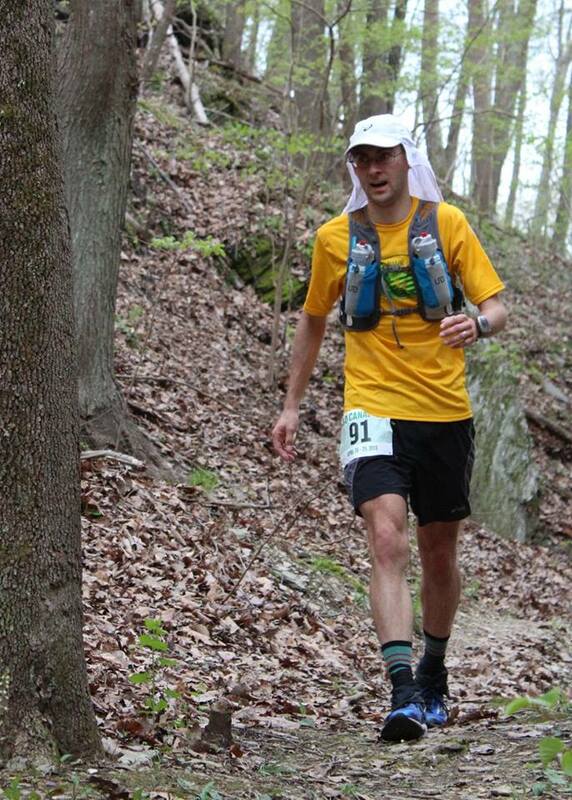 As I approached the finish I started to take in everything I had done, and I was happy. I didn’t care I got passed with two miles to go. All I cared about was that I accomplished what I set out to do. I couldn’t run another step, I gave everything my body had, I didn’t leave anything on the table. As I crossed the finish line I spotted Mallie and gave her a huge hug for being so supportive. I was done. I spotted Victor sitting on a chair, he had put 15 minutes on me in the final two miles. A truly impressive performance. I went and shook his hand and then Mallie and another volunteer guided me over to a bench next to the first where I sat down for the first time in 18 hours and 30 minutes. It felt glorious. As I sat beside the fire I had some soup and burrito and awaited the third-place finisher. I recounted some memories of the day with Mallie and the race director and then we saw a headlight In the distance. Crossing the line in third-place was another Jason, a strava-buddy that that I had meet on a training run. He ran an amazing race and his training really paid off. I was so excited for him. Being a local, I headed home shortly after Jason finish because I was getting cold. I was able to shower and get a few hours of sleep before heading back to the course the next morning to watch the final finishers cross the line. It was inspiring to see everyone finish, especially those that had been out there for almost 30 hours. Right now, the answer is no. I’m still in a lot of pain and I fear I injured my right leg. However, I know in a few weeks, after I’ve had some time to reflect, I’ll probably try to tackle another one to push my body to its limit again.